07 September 2016, Mannar District, Sri Lanka. 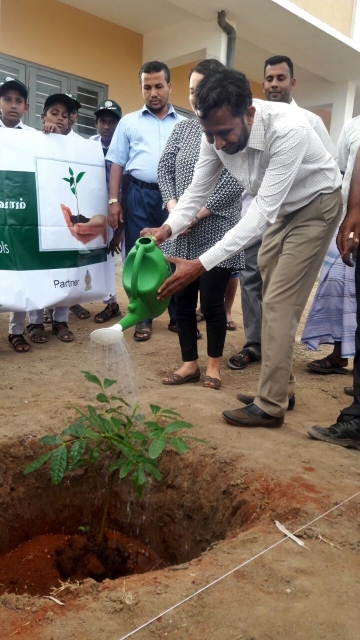 Tree planting ceremonies were held in two schools in Mannar district today to officially commence the “Greening Our Schools” initiative funded by the Japanese Government. Funded through the project “Rehabilitation of Community Infrastructure, Improvement of Livelihoods and Empowerment of Women in the Northern and Eastern Provinces (RCI)”, this initiative is implemented by UN-Habitat in collaboration with the Local Government authorities, Community Based Organizations (CBOs) and other key stakeholders. Seventeen schools have been selected for assistance. 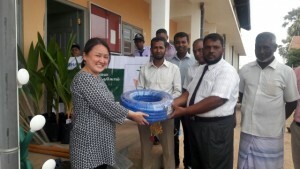 This programme will complement the “Sustainable Resettlement through Community-Driven Improvement of the Learning Environment in Mannar District, Sri Lanka” project funded by the Government of Japan and implemented by UN-Habitat from 2015 -2017. This initiative aims to create an inspiring learning environment in the selected schools through a number of activities. These include green fencing, school gardening and tree planting. The programme commenced with tree planting events at the Mn/Eachalavakkai GTM School in Manthai West DS Division and Mn/Kondachchi GMM School in Musali DS division. Mr. C. P. Amalraj, the Assistant Director of Sports and Mr. S. Visvarajah, Assistant Director of Education (Technical), Zonal Education Madhu Division, Ms. Keiko Matsuo and Mr. M.S.M. Aleem of UN-Habitat Sri Lanka participated in the events. Senior officials from the Zonal Education Office of Madhu division, religious leaders, Grama Niladhari Officers, members of CBOs and School Development Committees, school principals and teachers, school children and their parents also participated in the events. Several types of saplings were planted by school children and their parents for school fencing and landscaping along the school boundary and classrooms. Vegetable saplings were planted in demonstration plots to form school gardens. This activity will also contribute fresh produce towards the school feeding programme. School gardening tool kits were provided to the School Development Committees. During the ceremony, all participants confirmed their commitment towards the project by taking a special oath. 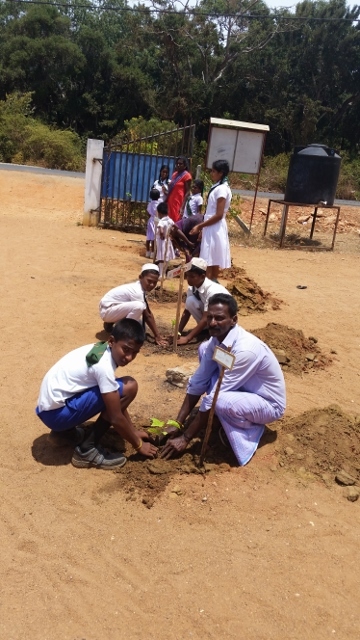 To ensure sustainability, each sapling has been assigned a student, who will be responsible for its upkeep. This initiative will be monitored by Agriculture Instructors, Divisional Officers for Agriculture, School Principals and Members of School Development Committees. The overall project is addressing the needs within the learning environment of these selected schools, including construction of primary and secondary school buildings, water, sanitation and hygiene (WASH) facilities for school children and teachers’ quarters. 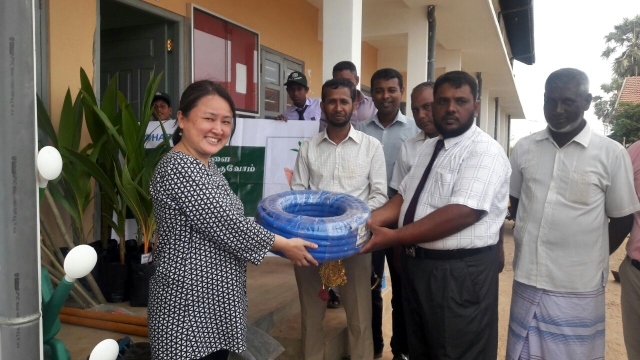 It will benefit over 10,000 returnees including 5,500 school children in the Mannar district.